I was watching this goose swimming and feeding when I noticed it dragging a wing. I don't think it will be migrating back up north. No but I bet it makes it to dinner !! The young the old and the infirm are preyed upon first. You are correct. There are lots of predators in the marsh. Gators, hawks, eagles and such. Thanks for looking. It's natures way. Thanks for looking, Bob. Thanks, Earl. He will make a meal for some predator and the cycle will go on. Yeah, it's a tough way to go. Thanks for looking, vz. Ken, looks like a bad break. The goose could end up as a snack for a gator. The photos show the break and DDLs the details. There are wildlife rescue agencies that are always willing to help. 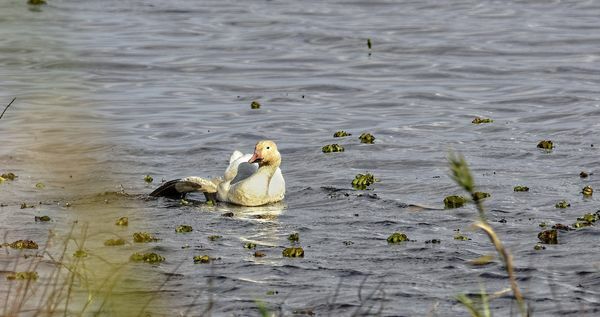 The goose could be rescued and placed in a zoo or compound. Just sayin! Poor thing. If he stays alive long enough, maybe it will heal? But will he ever be able to fly?